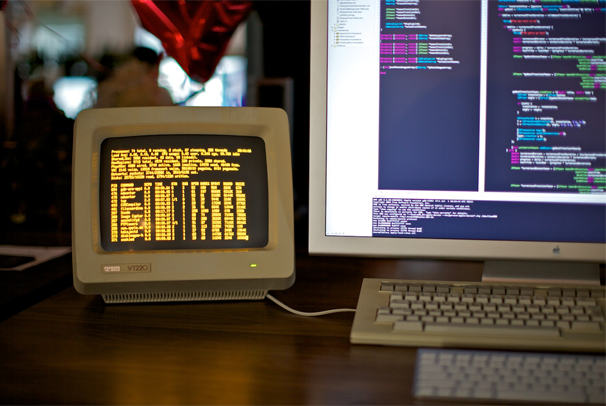 Are you ever struck with the urge to briefly get away from your nice color display, with its slim profile and large screen, to retreat to the warm glow of an old-school terminal screen circa 1983? One clever individual named Justin does just that, using an old VT220 serial console that he hacked to work as a terminal for his Mac Pro. In the days of yester-year, when computers were few and far between in an office environment, users didn’t have all their data on a hard drive within reach. Instead, a large mainframe running Unix contained all the data, and if you wanted any of that delicious data, you had to use a terminal to interact with the mainframe. Many things today still run on Unix, including Mac OS X.
Mac OS X has an application included called Terminal, which emulates what an old-school terminal would do on the screen, and it does a pretty good job. The VT220 here takes that job back, so instead of pulling up his terminal window he now just switches screens to his trusty serial terminal, no emulation required. If you want to make a similar terminal yourself, Justin encourages you to contact him, which would undoubtedly be quite helpful. I like it; I wouldn’t mind having one of my own, but I don’t feel I use terminal enough to justify it. What about you? Like it, hate it, want a different piece of old hardware back and in action? Tell us in the comments!